Man Remembers Brother With Down Syndrome In Touching Message: "They Teach Us What’s Truly Important In Life"
Calling him a brother wasn't enough. For this man, his brother was the biggest teacher who taught him what loving your family really means. For Stephen Nawrocki, his big brother was more than just a sibling to him. And definitely more than someone who had Down syndrome. He was Stephen's biggest teacher in life who taught him the true meaning of unconditional love. Michael breathed his last in February, at the age of 60. But he left Stephen and his two sisters a lifetime's worth of memories to hold on to. When Stephen was younger, he used to wonder how life would have been if his big brother didn't have Down Syndrome. But later, he realized that it was the one thing that made him special and brought so much compassion to Stephen's life. In a heartfelt tribute to his brother, Stephen wrote on Facebook, "He was my big brother, my buddy, my best friend. I sometimes say that I would not wish Down Syndrome on anybody, but at the same time I wish every family had someone in it with Down Syndrome. They teach us what’s truly important in life. It’s not about money, cars, houses, accomplishments. It’s about being happy, it’s about loving and being loved, it’s about faith and trust." "Would he have been a teacher, a carpenter, a psychiatrist, a priest, a doctor?" Stephen had wondered. He eventually realized that Michael was all of that in his own unique way. He went on to write, "You see, he was a teacher, he taught me about love and kindness and acceptance and tolerance. He was a carpenter, he showed me how to build relationships on honesty and trust, that these attributes are the nails and screws that keep things together and solid. He was a psychiatrist, he helped me to realize what’s important in life and to not worry about things outside of my control, to take the good in life and cherish it." Down syndrome is often thought of as a horrible disability, but what many fail to realize is how nurturing and kind someone with the condition can be. And Stephen's post beautifully captures that. Michael was also the priest and the doctor to his little brother, who taught him some of the biggest lessons in life. Stephen continued to say, "He was a priest, his innocent and pure and unwavering belief in Jesus and God was an inspiration to me as I finally came to faith. He got it long before I did, so who was the handicapped one, right? He was a doctor, he helped cure me of ignorance, intolerance and anger because of his sweet nature and his ability to love unconditionally." 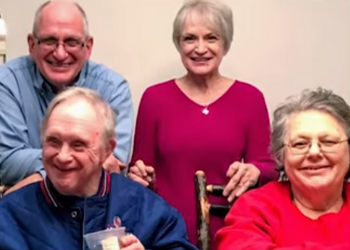 His touching message was shared thousands of times and it showed the world just how loving people with Down Syndrome can be. Stephen received messages from all over the globe. "I've heard from people on every continent except Antarctica," Stephen told Good Morning America. While Stephen, Michael and their two sisters were raised by a single mom, they shared a number of memories together. "He had a determination he was not going to be left out of anything," said Stephen. Playing on the baseball team with his brother and winning the race at the Special Olympics are just a few things for the family to remember Michael by. During their childhood, there were even times when Stephen stepped in for his brother and got into fights for him. He said, "It didn't matter if I was 8 and they were 12. If they made fun of him I went after them." One of the things that Stephen will always remember about his brother was that he was able to enjoy the little pleasures that life had to offer, and that included "Ice cream and hugs". Stephen never imagined that his tribute to his brother would reach so many people and inspire them. For him it was "a way to cope. I never expected it to be shared so widely. I'm so humbled." "He was a better person than I am. I will always love him, I will always miss him. People say that I took care of him, that I did a lot for him. I laugh because he did so much more for me," he wrote towards the end of his post. "Thank you Michael, for being an inspiration. Thank you Michael, for being my buddy, my best friend. Thank you Michael, for being my big brother. Heaven got a good one."